First medical visits always include the same questions, how old are you, what is your phone number what is your address, do you have your care card and last but not least, what is your family history? We do realize it’s a lot of questions to ask you and understand that it does get tiring after a while but asking about family history is an important part of a comprehensive exam since many eye diseases run in families. Here’s two examples: Glaucoma and cataracts. Chances are many of you have heard both terms used before but people get them confused for one another almost 100% of the time! In this blog I would like to explain the difference. Glaucoma is a sight threatening disease which affects the optic nerve in the back of the eye. Not one single test can be done to determine if a person has glaucoma. Most glaucoma is diagnosed by seeing a change in the optic nerve or peripheral vision over time. In severe glaucoma a patient may completely lose their vision. Most patients will not have any symptoms that they have glaucoma until the late stages of the disease. 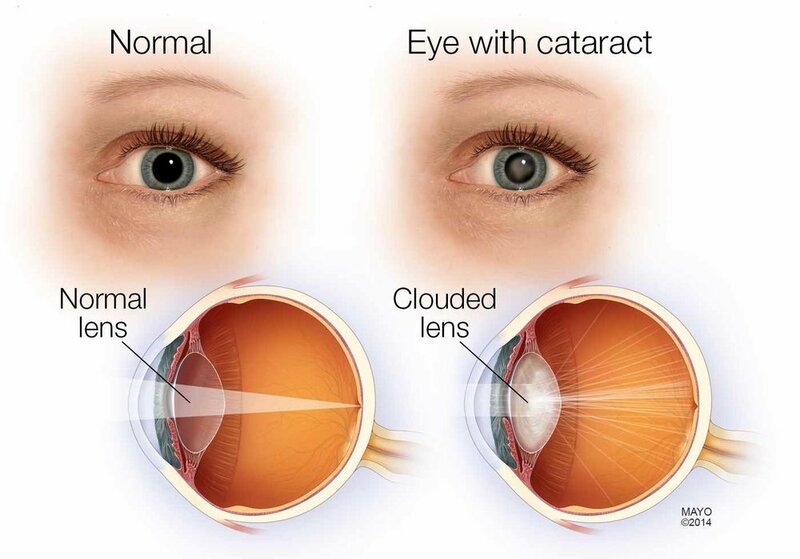 Cataracts affect the lens inside the eye. There are different types of cataracts which grow at different rates or at different ages but most of the time they are a yellowing of the lens. A person would never go completely blind from cataracts as long surgical intervention is available. Cataract surgery can be done where the cloudy lens is replaced with a clear plastic one. Another benefit of surgery is that you can put almost any prescription into the new lens which would eliminate the need for glasses for most tasks, however most of the time reading glasses are still needed. Average age for needing surgery is around 75 years old. I hope this helps you understand the difference in between glaucoma and cataracts and that it didn’t make you fall asleep. At View Optometry, our team is focused on providing comfortable and convenient eye care to the residents of North Vancouver, West Vancouver, Deep Cove and Lynn Valley. If you are looking for a friendly team of eye care professionals then we would love to welcome you at View Optometry!